Sundays — Sun: 8:30 a.m.
Daily — Thu: 8:30 a.m. during school year (6:30 p.m. during Summer), Fri: 11:30 a.m.
Before a Catholic church was built in Howardstown, priests coming from Hodgenville would swim or wade the Rolling Fork River to celebrate Mass in private homes. 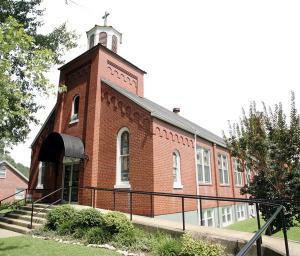 The first St. Ann Church was erected between 1862 and 1865 on the site of the present cemetery, and the first school was built nearby. The first resident pastor, Father Engelbert Schmitt, arrived in 1915 and stayed for eighteen years. He was responsible for the construction of a rectory and convent buildings in 1919. Later, the convent was razed for a new rectory and a large garage. The Ursuline Sisters of Mount St. Joseph began to staff the school in 1919. Father Bartholomew J. Beruatto arrived in 1933, fostering tremendous growth, and a three-room school was built. Ursulines and lay teachers have continued to teach in this schoolhouse with a few renovations such as indoor restrooms and electricity. Constructed in 1935, the present church contains the altar and various statues from the original church. After years in storage, the church’s original altar rail was rediscovered and reinstalled as part of the current altar. Two wheelchair ramps now allow access into the church and into to the church basement. The 1930 Wick pipe organ was restored in 2001, and parishioners added a pavilion to the garage for picnic guests. An annual picnic, established in 1978, has become a beloved tradition with original Howardstown families returning to renew old acquaintances and stroll around parish grounds. The Archdiocese combined the administration of St. Ann and St. Vincent de Paul in New Hope in the early 1990s. Four years later, St. Ann Parish was combined with Our Lady of Mercy in Hodgenville, sharing a pastor. Today, St. Ann and St. Vincent de Paul share a pastor again. A rural sense of place and history inspires the nearly 150 parishioners with pride in the church as the center of their community. As young adults return home to raise their families in this peaceful valley, St. Ann Church will continue to serve the people’s needs for faith and life.